On a sunny summer day in Helen Georgia, you take a look up the Chattahoochee River. What's that you see floating towards you? Is it a strange flock of colorful river birds? An extraterrestrial being from outer space? Some new mutationof algae? No! It's a flotilla of inner tubes engaged in an essential northern Georgia past time — tubing. No stay in the rental cabins in Helen in the summer is complete without participating in this right of passage. As you have been making plans for your vacation to northern Georgia, you have probably heard how much fun tubing in Helen Georgia is! In fact, tubing is the top activity in the area (at least during the summer). So what is shootin’ the ‘Hooch, you ask? It is simply taking the plunge into the magnificent Chattahoochee River and having a fun day on the water with your family and friends. For these two hours, you and your family or friends can relax and enjoy the natural beauty of Georgia as you lazily float your way down the Chattahoochee River and through the center of Alpine Helen Georgia. Two tubing companies in Helen gladly provide tubing services in town — Cool River Tubing and Helen Tubing and Waterpark (scroll down for more details on both). Both offer different floats down the river and a fun-filled water park with slides and splash pools to finish off our day. For those who have never tried their hand at tubing before, you may be asking, “What will I need to bring? What should I expect?” For the best possible experience and an entirely pleasant afternoon on the river, we’ve compile this comprehensive guide with everything you need to know about tubing, including the winter kind. What Is Casual River Tubing? Enjoy Your Tubing Time - What Makes It So Great? The mighty Chattahoochee River starts as a spring in the Blue Ridge Mountains and flows down through the mountains, the Chattahoochee-Oconee National Forest and on through the town of Helen before continuing it's 430-mile journey to the Gulf of Mexico. 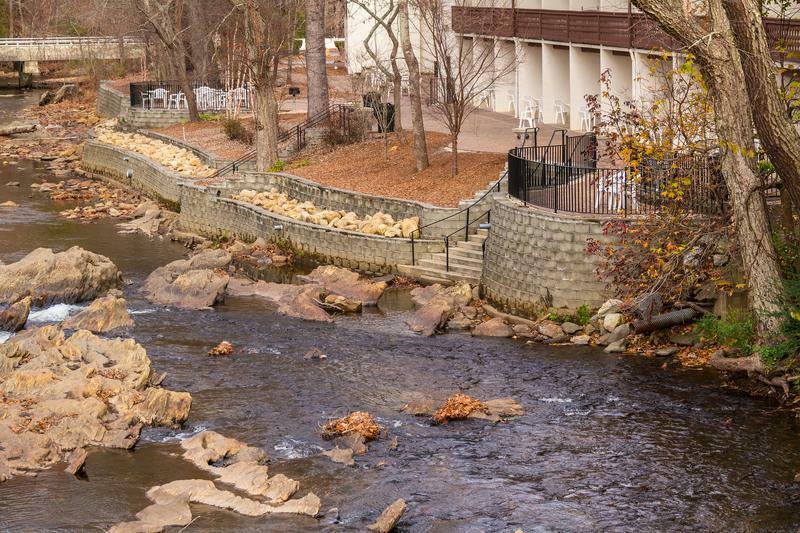 The portion of the river that flows through Helen is relatively calm making it the perfect site for inner tubes to peacefully float through town. On any warm summer day, you'll see tourists and locals on brightly colored tubes making their way through town enjoying the "Hooch"; and no Georgia mountain vacation is complete until you "Shoot the Hooch". 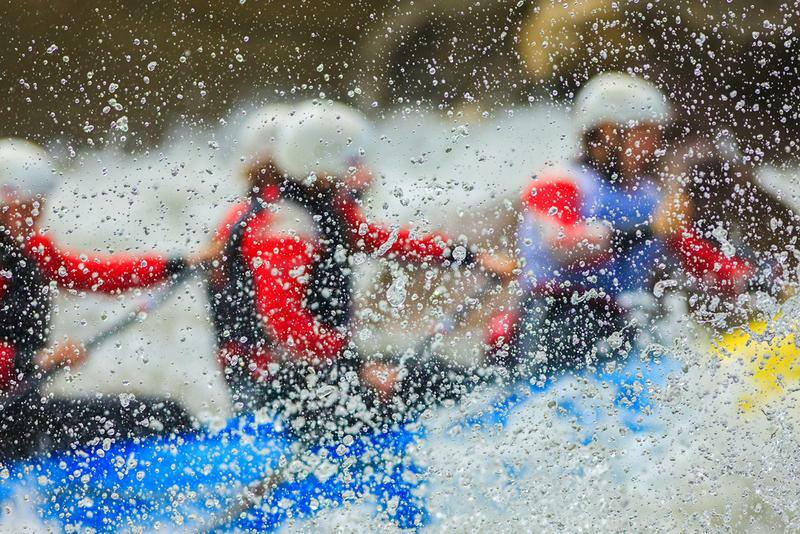 While white water rafting is more known as the happening sport for rivers; it may be a little bit too intense for some and downright scary for others. You may think of canoeing and kayaking as “hard work” and that is the last thing you want to think of when on vacation. Tubing is definitely a must try for everyone. Tubing is a river ride that takes you downstream in a tube through the most amazing and beautiful sights seen. Think of like sunbathing and relaxing in the water at the same time. An inexpensive alternative to water parks where you simply sit and slide. Tubing allows you to sit in a tube and float downstream. 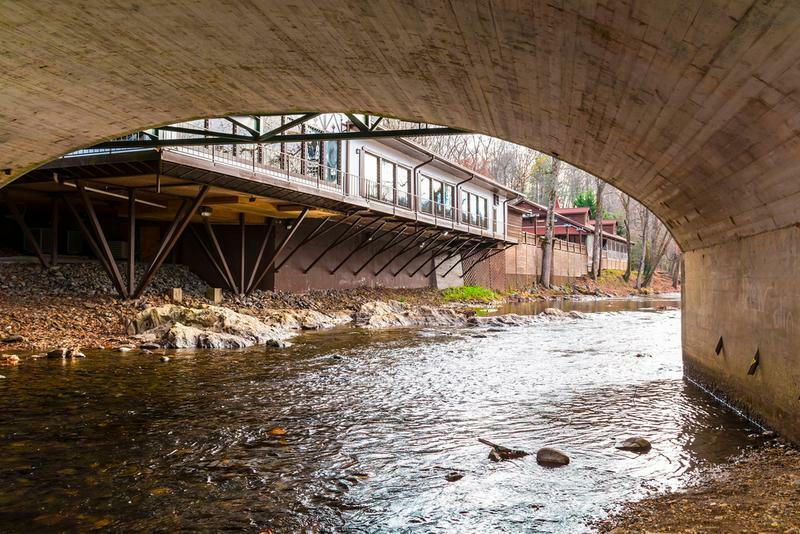 For a low price, you’ll be toted up the river via a short bus ride and dropped off with your inner tube to enjoy your adventure down the Chattahoochee River. It’s been known to natives for years, but now is quite popular with visitors. Many families will choose tubing over other activities quite simply for the relaxation that a vacation should offer. You will begin at the top of the river and then float downstream usually lasting between 2-3 hours. This is something that you enjoy alone just to think. It is fun for couples and families as well. You can also tie your tubes together and just float along, pointing out different wildlife and trees. Georgia has some of the most beautiful scenery around. Planning a vacation with tubing through Helen would be a naturally breathtaking experience for the entire family. If you're visiting Helen during the warmer months, you absolutely cannot skip out on this opportunity! 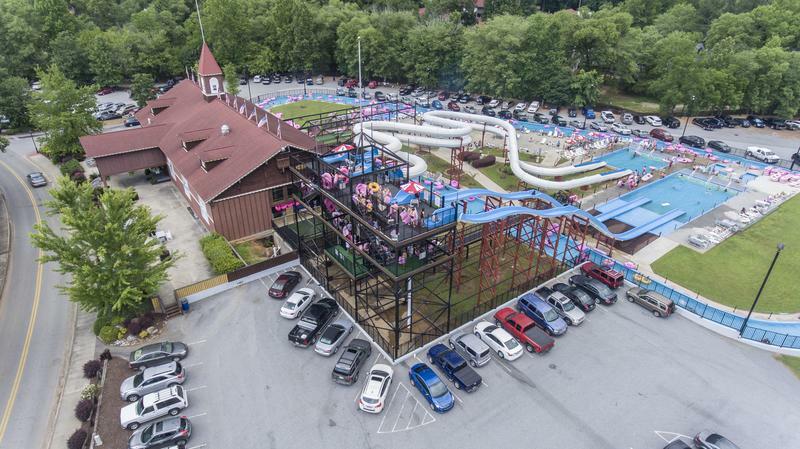 The Helen, Georgia Tubing and Water Park offers tubing and a water park. If you’re still not yet convinced, here are six reasons why tubing is so great. It is not always easy to find vacation activities that are both affordable, and that everyone in the family will enjoy. Of the many fun and budget friendly things to do in Helen, tubing is definitely the most popular. Besides being a great stress-reducer and family bonding experience, the budget friendly Helen tubing can be enjoyed for as low as $5 per perso. For those who are not necessarily "outdoors" people or "adventurers", tubing may sound a little bit extreme. In reality, tubing is an entirely relaxing and fun way to spend your day bonding with others. You and your group can plan your tubing experience around the time that you have to spend making it a quick one hour or a lazy two hour venture. During the entire time that you and your family are tubing, you will have plenty of time to truly escape the worries of the real world, all of your electronics, and truly focus your attention on laughing and splashing together. Whether you are looking for a quiet afternoon on the river with your thoughts, a romantic day with your sweetie, or a fun and exciting family bonding experience, tubing is the right pick for you. Depending on how much time you have on your hands, you and your party (or family) can enjoy splashing, playing, drifting, and relaxing for either a one hour or two hour tubing excursions. As you enjoy your journey down the river, you will be given plenty of opportunity to laugh, talk, and experience the gorgeous scenery of northern Georgia together. All of these elements combined is what truly makes tubing an incredible experience! And, It’s Great With The Girls. Helen tubing is great for a long girls’ weekend or plan the world’s most relaxing honeymoon. Whomever you are with, you are sure to enjoy a day on the Chattahoochee River in Helen, Georgia, tubing. There are three words to describe tubing in Helen, “Beat the heat”. Being stuck inside on a hot summer day is not the most attractive idea for a vacation. One thing that makes tubing such a popular attraction to thousands of visitors is that it’s the perfect cure for a hot summer day on a budget. Floating down river in the cool Georgia Mountains can make even the most dreadful of days seem a whole lot cooler. Many of us with kids are seeing them get more and more addicted to their smartphone, games and television. But, if you get your child in the river, at least we get them off the phone for two hours and that's a start, right? You and your kids will have a great time in the water, and sharing an experience you simply wouldn’t get back at home. You will have two hours free from the distractions of phones and video games to simply talk, play, and enjoy the scenery. Get into nature and most of all... Have Fun. Though we often have good intentions when it comes to planning a getaway, it seems that all too often our plans go awry. 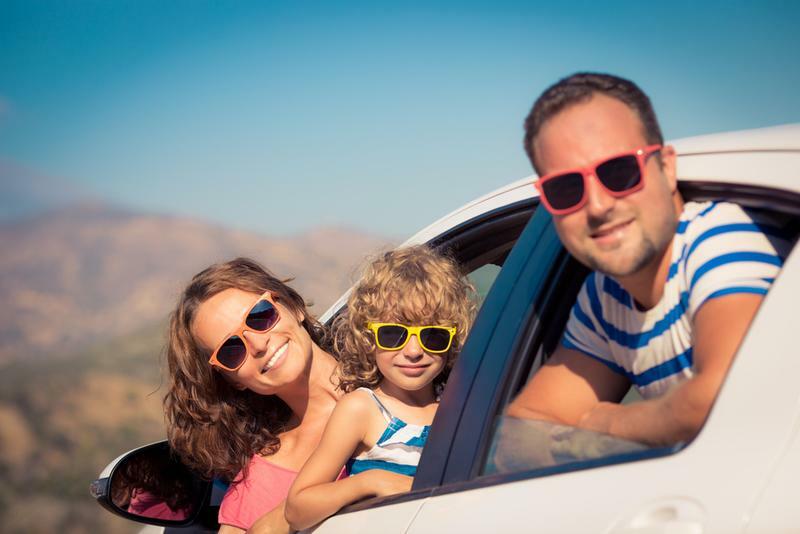 Hot weather, long lines, and yucky hotels can really stand in the way of having fun with your family. 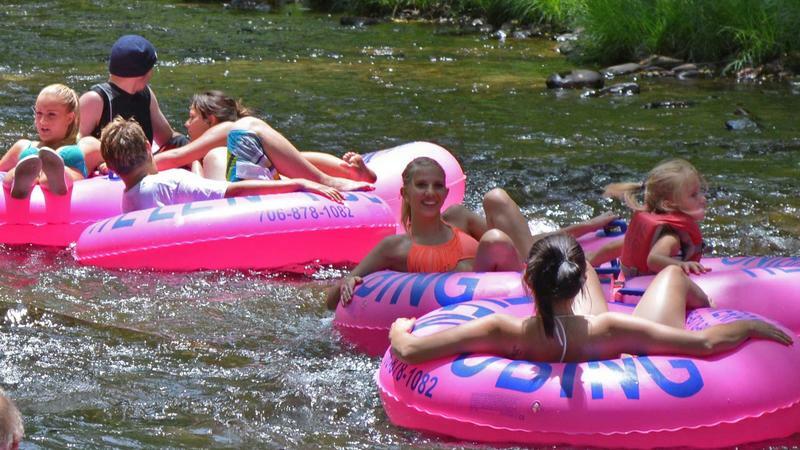 Going tubing in Helen, GA is the best way to make sure that everyone will have a good time! You will be bussed up the river to one of two starting locations, based upon whether you would prefer a one or two hour tubing tour down the Chattahoochee. The idea of getting into a river may not appeal to you right away. You can rest assured, however, that the Chattahoochee River is far from some muddy, dirty body of water. On the contrary, in fact, the Chattahoochee River consists of cool, sparkling waters that will get the stamp of approval from anyone! For hours, you will be able to relax as you lazily float down the river in a cool, peaceful bliss. All along the way the vast timberland forest of North Georgia lines the river, creating a beautiful and shady canopy above the waters. You may spot a variety of wildlife including native birds, rabbits, chipmunks, deer, and more! Your tubing path will even lead you through the village of Alpine Helen itself. You'll take in the sights of this quant area as you pass by, and float underneath the beautiful bridge. Along with your group, you will be able to discover the gorgeous views and vast forests lining the river, and can point out various plant and animal wildlife that you may encounter along the way. You may also discover places where you can “pull off” your tube and swing from a rope over the river and make the jump into the inviting waters before you resume your journey downstream. You and your family can also expect an abundance of bonding time and memories created together. In a digital world, it is often difficult to escape disruptions from TV, video games, computers, cell phones, and bluetooth sets. Imagine leaving these behind for two full hours so that you and your family can simply be together, talking and laughing, discovering nature together, and really coming together. There is no experience like "shooting the 'Hooch" to get a family having a great time in each other's company. The fun doesn’t end when you hit the “take out” point, however. 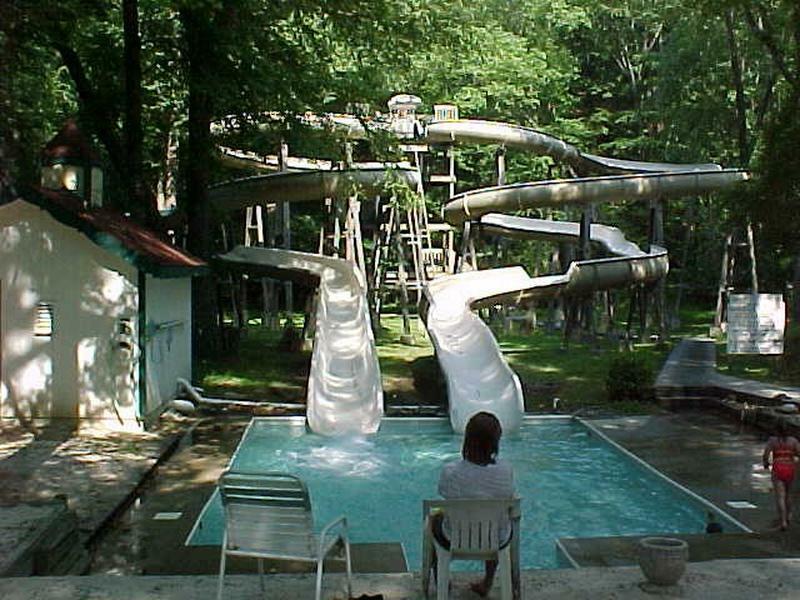 Multiple tubing companies provides water slides for some added fun after the tubing excursion. And if you are feeling hungry, you and your group can finish off your day by enjoying a yummy picnic lunch in one of the designated picnic areas. Looking for a great place to cool off this summer? There's nothing more refreshing than jumping into the water with both feet. Whether you're ready to "shoot the 'Hooch" on a tubing excursion down the river, or would prefer to splash in the controlled waters of a water park, Helen Tubing & Water Park is the place to be during the warmest months of the years. As one of the biggest Helen attractions, this spot is a big draw for both locals and vacationers, and you're sure to have a blast during your visit. Get ready to make some happy memories with your family and friends in the waters of northern Georgia! 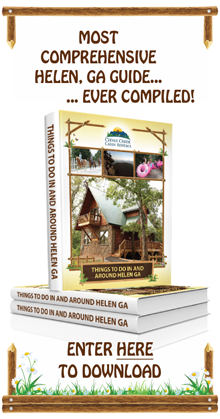 At Helen Tubing & Water Park, you've got plenty of options for how to spend your day on a budget you can afford. For those who are running a bit short on time, you might want to just go with a single tubing pass for just $5. The cost of admission gets you a tube, a life vest, a shuttle ride, and the tubing adventure of your choice. You can pick from the short run, which will take about 1 - 1.5 hours to complete, or the long run which takes about 2 - 3 hours. The best value is to purchase admission ($20) to the water park which will provide you with access to all of the park's attractions, as well as tubing on the 'Hooch. water shoes, push off stick, neckbox, sunglasses, and bathing suits are available for an extra fee. Tubing in Helen is a one-of-a-kind experience that everyone will love. No matter how old or young you are, you can enjoy the relaxing sensation of floating peacefully along the river as you pass through trees and are able to observe the gorgeous northern Georgia scenery. Helen Tubing and Waterpark lets you choose between tubes with open centers and tubes with bottoms, which might better suit younger tubers. Along with your life jacket, you will also get a free shuttle ride to the launch points. Free shuttles pick up visitors at the water park every 15 minutes, so you can ride the river as many times as you want, or migrate over to the water park to finish your day. Once you’ve finished floating down the Chattahoochee River, the Helen Tubing and Waterpark offers all day fun in the sun. When you're done with your ride, you'll feel refreshed and renewed. For those who aren't crazy about the idea of getting into the real river, a 1000 foot lazy river is available inside the park, where adults will enjoy meandering around the park. There are four different giant water slides for you to check out, all of which are over 50 feet tall for extra thrills. Choose from a curvy, crazy ride into the wading pool or a slower, more relaxed descent. Kids will love flying down these slides, splashing into the pool and then racing back up to the top once again. Children must be at least 42 inches tall in order to race down the park's slides. 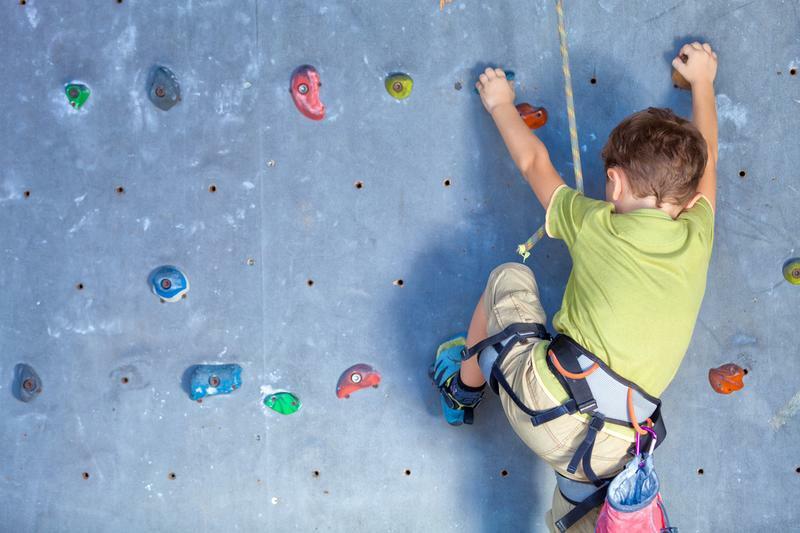 The park contains a 25 foot climbing rock wall, and your kids will be crazy about the park's airbrush tattoos. If you're feeling hungry, concessions are available so that you can fill up before getting back in the water. You can keep an eye on the kids, soak up some sun and enjoy the soothing current of the river. Who knows? Your kids may even jump in the lazy river for a few spins when they get tired of the slides. (Yeah, right.) Toddlers will have fun playing in the lazy river (it's only 2 feet deep), tubing with Mom & Dad on the 'Hooch, or playing on the dry playground. Lifeguards are always on duty at the park during hours of operation, so you can rest assured that you and your kids will be safe throughout the day. Even those who don't want to get wet can enjoy watching the rest of the family in the water. Rocking chairs are set up under a shaded pavilion so that you can relax, enjoy the breeze, and take in the sights and sounds of the park. There's something for everyone to love! Helen Tubing & Water Park is great fun for kids (and adults) of all ages! That makes it a perfect choice for spending the day playing and bonding with your whole family. The other great Helen tubing company is Cool River Tubing. At Cool River, you can shoot down a twists and turns slide or take a smooth and relaxed ride, both ending with a splash into the wading pool. Or really embrace the spirit of your youth by launching your tube down a slip n slide, just like you did as a kid. In fact, you'll probably have to fight your kids for position in line for this one. Cool River also offers several different trips down the Chattahoochee River. You'll keep cool, take in the sights, and make many happy memories. So, come on in - the water's fine! Cool River Tubing is our recommended tubing company since they have the biggest and best tubes for Helen Georgia. The cost for shuttle service, inner tube and a life preserver is still only $8.00 per person. All day tubing is $12 and water slide is an extra $5 (combos & group rates are available). Children 3 and under participate free of charge with a supervising adult. Cool River Tubing offers a short float and long float down the Chattahoochee River. The short float lasts about 60 minutes and the longer float lasts a little more than two hours. Your ticket to tube includes the inner tube, a U.S. Coast Guard approved life jacket and shuttle service. And it's all just a short drive from your rental cabin. Throughout your trip, you'll be able to look up at the clear blue skies above, and enjoy incredible views of the forests, and plant and animal life along the banks of the river. It's one of the best ways to get an up-close look at the spectacular nature of northern Georgia, and it's an experience unlike any other. Can't get enough of the water? You should consider buying an all day tubing pass so that you can take advantage of the cool, refreshing, and relaxing waters for hours on end. Cool River Tubing Company is one of the most popular Helen attractions, offering a day of fun for the whole family. Although there are some deeper areas of the river, the majority of your tubing journey will take place in relatively shallow waters which makes it possible even for non-swimmers to shoot the 'Hooch. The minimum age for tubers is 3 years old, and life jackets are definitely recommended. For Mom & Dad's peace of mind, tubes can actually be tied together so that you can ensure that your little ones will remain by your side, however, Cool River doesn't recommend that you tie more than 2 tubes together at a time. If you want an entire day of fun on the river, buy an all day float pass and passes to the waterpark. You can break up your visit to the area by getting out at Alpine Crest in order to race one another down the dual water slides. One slide takes you through twists and turns while the other slide is more smooth and relaxed. Both slides end in a big splash pool. These slides are accessible half way down the river float. The park also includes picnic areas and concessions so you can spend the whole day with your family. You can stop at the outpost for ice cream on the way out, and pick up pictures of you and your kids coming down the river so that you will always have fun memories of your afternoon Shootin’ the ‘Hooch. And all new for Cool River Tubing Company is its own zipline tour located at the headwaters outpost in Helen. With so much to do and experience, you may even want to come back for a second day! Whenever you're planning on spending a day in the sun and water, it's important to take the time to make sure that everyone in your group is protected with a waterproof sunscreen for safety. If you're coming to the water park with kids who aren't potty trained, you'll need to show the park that the little one is equipped with a "swimmie" diaper that's specifically designed for the water and a waterproof plastic cover for the diaper. Both of these items can be purchased in the water park's store once you arrive. Be advised that dogs are not allowed in the water park, so if you're traveling with your pooch, you'll need to arrange to have him stay behind at the cabin or send him to doggy daycare. Water shoes aren't required, but are recommended to protect feet in the river, and as the concrete around the pool can get hot during the day. Below, we share additional tips and insights for making the most of your next tubing expedition. Water is key to staying hydrated. For both you and your children, be sure to bring a sufficient supply of water as you can be certain someone along the way will need it. Each tuber is allowed to bring a thirty-two ounce beverage cooler. Alcohol, however, is not permitted. Tubing through Alpine Helen will certainly bring you lots of fun. So much so, that you may not realize how much sun you are getting. Before getting into a tube and settling in for the ride, it is essential that you and your family are wearing sun block. Even though much of the river is shady, and there may be days when there are clouds in the sky, harmful UV rays are still capable of finding their way through and causing harm to your skin. You’ll also be exposed to the sun throughout the day, and that the reflective properties of the water will only enhance this effect. Your safety is first and foremost when tubing, so to avoid ending your day with a painful sunburn, it's very important to remember to wear adequate, waterproof sunscreen in order to protect your skin against UV rays. Additionally, if you are fair skinned it may be a good idea to schedule your trip in the morning or late afternoon when the UV levels are lower. Remember what your mom always told you and always wear sunscreen! Protect yourself and your family before a day of tubing. You will not regret it. Definitely bring/buy a "push off" stick with you. This handy little tubing “tool” will keep you moving down the river without a care in the world. The poles are also good for pushing yourself away from the shore or rocks that you may encounter along the way keeping you and your family floating smoothly down the river. When other tubers are getting a little too close for comfort or keep bumping into you, you can use your pole to push them away. Many of the tubing companies will allow you to pick up a push pole (for an additional fee) that will keep you moving down the river and having fun. A push pole, whether purchased or brought from home, will come in handy on your next tubing adventure. Your tubing adventure will provide you will some of the most incredible views of Helen, so make sure you bring a camera that is designed for usage in the water. If your new or old high tech smartphone isn’t waterproof, consider getting a waterproof container or picking up a disposable waterproof camera for the river. As you bond with your family and take in the gorgeous scenery of northern Georgia and the Alpine Helen area, you will certainly want to capture those precious moments.You can take pictures of your kids shootin’ the ‘Hooch or of the gorgeous northern Georgia scenery. Disposable, waterproof cameras are an affordable way to preserve the memories of your fun day on the Chattahoochee River and you can pick them up in just about any local store. There are areas of the river that may only be a foot or two deep. Underneath the surface of the water lies rocks and potentially left over items from previous tubers. Bare feet and flip flops, which can easily come off, will not provide the protection you need. However, you can prevent injury by wearing water shoes that will stay on and protect your feet from what lies below. To protect your feet from any rocks on the river bottom, water shoes may be a good idea. Any time you are on the water, you should consider wearing a life jacket. This is especially important if you have small children or non-swimmers. Accidents can occur, but by going prepared with the proper safety items, you can keep both you and your family out of harm's way. Tethering your group's tubes together may sound fun, but to make the ride more enjoyable for everyone it is a good idea to keep them separate. By tethering the tubes together you will likely spend the majority of your time trying to get them unstuck from each other, rocks and the surrounding landscape. However, this is different if you have children. Tethering your child's tube to yours is an excellent way to keep them safe and within arms reach. If you or members of your group are not very strong swimmers, it is not advisable for you to attempt a swift water tubing trip. For safety, stick with slower, shallower waters. Rolling Thunder River Company will also allow you to experience tubing on the dam controlled Toccoa River. This company will offer riders a paddle to help riders to navigate down the river when the water levels are lower and the current is slower in the morning. During the afternoon, swift water tubers will be given the option of extending their journey from one mile to three miles so that they are still able to ride the river for an hour, instead of just twenty minutes. Yet another river that you can choose to explore on your north Georgia vacation is the Coosawatte. 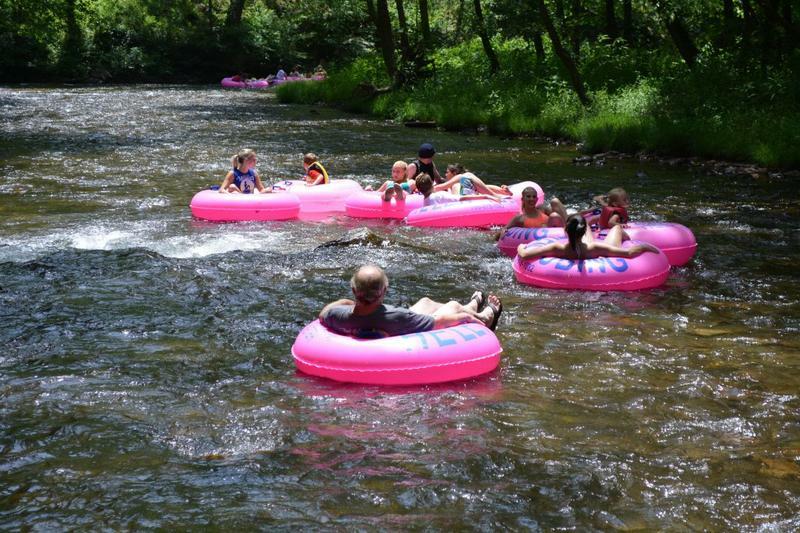 The tubing company is located not far from our cabin rentals, in the town of Ellijay. The breathtaking scenery along this town is enough to make the hour and a half drive to the launching point worth your while. 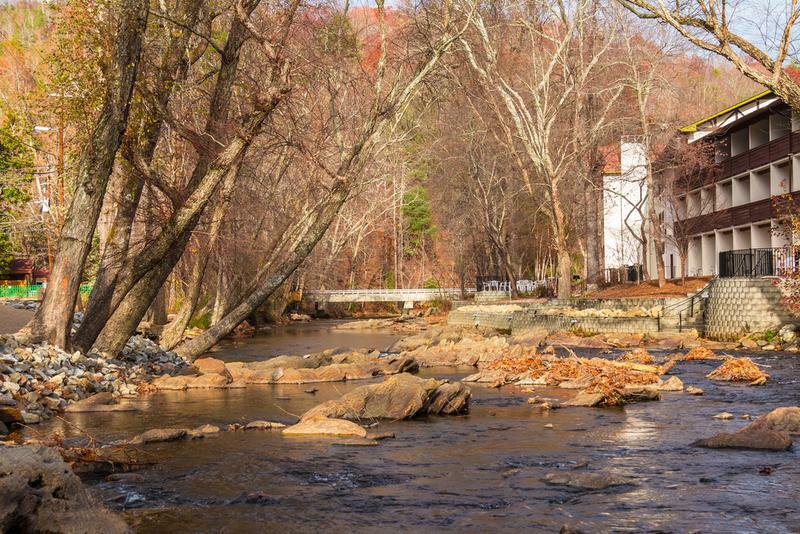 Nestled in the Blue Ridge mountains, you'll float past spectacular mountain views, forests, and quaint villages. There's no better opportunity to look out for native plant and animal wildlife and enjoy the sights and sounds of northern Georgia with your family than while you're out on the water. Because this spot is such a popular destination for tubing excursions, it is recommended that you make advance reservations. Southeastern Expeditions will set you lose on the very waters filmed during the classic horror movie "Deliverance" - the Chattooga River. Don't worry - no crazy backwoods folks will be lurking to tip you out of your inner-tube. 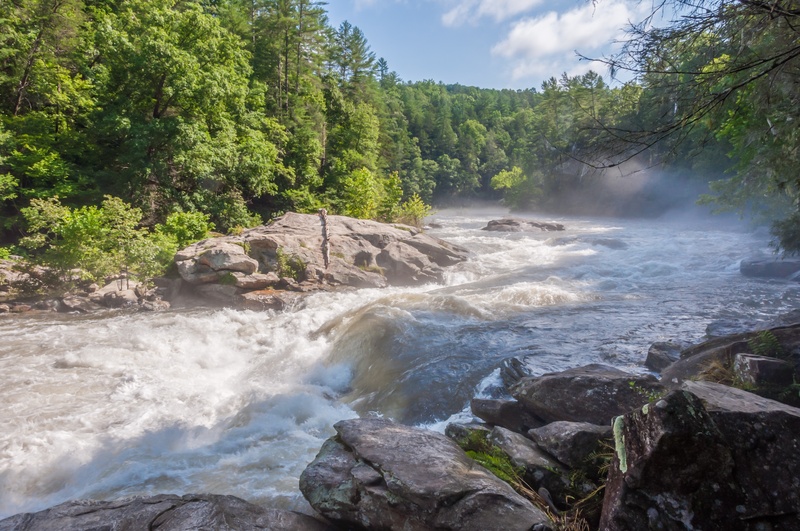 Although Southeastern Adventures largely caters to adrenaline junkies who are looking to battle the wild rapids throughout the Chattooga, there are still plenty of opportunities for your to have fun on a more tame way. Area two of the river is available for tubing with some mild class II rapids so that you can have adventure and excitement without compromising your safety. If you are planning on making the trip to northern Georgia during the winter months in order to experience the beauty of the snow capped mountains, you will love the opportunities that you will have to do some tubing even when it's cold outside! Both Snow Mountain and Scaly Mountain will provide you and your group with a full day of snow tubing, playing, and enjoying each other's company. 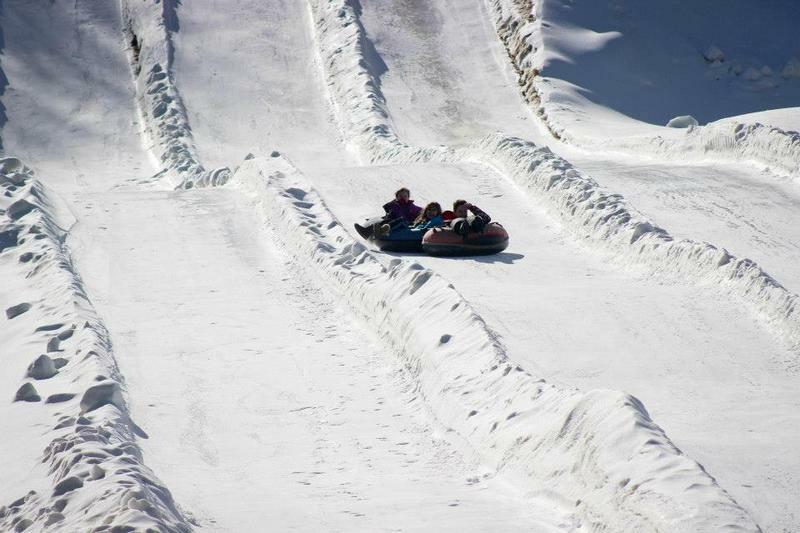 Located on the west edge of North Carolina, Scaly Mountain offers snow tubing year round! Artificial turf is set up during the summer and cold, delightful snow provides the foundation for your tubing adventure in the winter. You'll take a "magic carpet" lift to the top of the mountain before flying down on your tube, laughing and playing with your family and friends. Kiddie slopes are also available for the little ones. There is nothing quite like gathering up your group and racing down the snowy slopes together on snow tubes. As you slip and slide down the powdery white terrain, you will be creating lasting memories while laughing and playing the day away. In addition to snow tubing, Scaly Mountain also allows opportunities for its visitors to go ice skating, build snowmen, and even trout ice fishing! When you need a quick breather and decide to take a break from tubing, you will still have plenty of other fun snow related activities to engage in. Located in Stone Mountain, Georgia (metro-Atlanta), Snow Mountain is a hot spot for locals and travelers alike. Here you’ll enjoy trying your hand at multiple tubing lanes such as Tube Runners (this is a set of ten lanes designed for single riders) or Avalanche Alley (a set of three lanes intended for multiple riders). You will not need to bring any tubing equipment with you as everything you will need for tubing fun is included with the cost of admission. Snow Mountain is equipped with several play zones. Fort Snow is set up with turrets, tunnels, and slides is absolutely perfect for those under 54 inches. You and your whole group can enjoy heading over to Snowman Valley. Here you will be able to build your own snowman and give him (or her) a name and face and you will even be able to dress your snow person up in a now suit. A "Snow Closet" is available for you to pick out all of the essentials (like silly hats and crazy scarves) required to help you build your ideal snowman. You will also love the Snowball Shooting Gallery. What could be more fun than a packing and playing with a good ol' fashioned snowball? At the shooting gallery you can pack a hundred of these bad boys and shoot at crazy targets which flip, spin, and turn whenever you hit your mark. And don't forget about Igloo City! You can become a snow architect in this fun area designated for construction forts, digging tunnels, and building all sorts of snow structures! Wrap up your day with a cozy bonfire at SnoFire Point and some yummy S'mores! Whether you would like to tube solo, ride with a family member or friend, or get your group together to all go racing down the different track lanes to see who can go the fastest, there is truly something for everyone at Snow Mountain! Before visiting, be sure to check Snow Mountain's website for any height or weight restrictions. What's the best part of shootin the Hooch? Returning to the conveniently located rental cabins, where you can catch views of the outdoors from your deck after you dry off. Enjoy using your own kitchen to make some snacks or have some drinks, play a game of pool or another game, or sit on your balcony and enjoy the view. If you haven’t gotten your fill of relaxing water just yet, sit in the spa in your hot tub cabin or soak away in the large Jacuzzi bathtub. Click here to view cabin availability and pricing. What other tips and suggestions would you offer up to tubing novices? What kinds of experiences have you had with shootin’ the ‘Hooch? What excites you the most about tubing? Do you have any advice for new or seasoned tubers? We would love to hear about it in the comments section below!